Jaipur, the Pink City of Rajasthan was founded in 1727 AD by one of the greatest rulers of the Kachhawaha clan, the astronomer king Sawai Jai Singh. The pink color was used at the time of construction of buildings to create an impression of red sandstone buildings, repainted in 1876, during the visit of the Prince of Wales. The city has it all whether forts, palaces, hotels and gardens. The red sandstones used in the structures capture your eyes even at a short glance in the city. 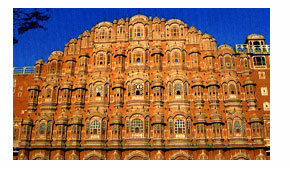 The city of Jaipur is the prime example of the culture and tradition of the Rajputana Empire. In this land, towering forts were built for the fortification of the city. The royal city of Jaipur owes its name to the founder of the city, Sawai Jai Singh II (1693-1743) who founded Jaipur in 1627. The city was well planned, structured, and had one of the best drinking water systems in the medieval world. Being the capital of Rajasthan, the city is mirror to every thing that Rajasthan signifies, be its culture, tradition, society, and, most important, the people. Hawa Mahal is the renowned landmark of Jaipur. As against the popular belief, it is not really a palace. It is a sandstone screen veiling the ladies of the court who could watch the proceedings on the road below without being noticed. The City Palace is a perfect blend of Rajasthani and Mughal architecture. The palace is now converted into a museum exhibiting the arms and ammunitions used by the royal family in the past. Jantar Mantar is only one of the five observatories constructed by Jai Singh, which shows his passion for astronomy. Central Museum, situated in the Ram Niwas Gardens, has a large collection of costumes, woodwork, brassware, jewelry, and pottery. The hilltop forts like Nahargarh, Jaigarh, and Amber forts recreate the magical past in the most vivid form. Each of them embodies royal traditions of splendor and military one-upmanship. The other tourist places are Jaipur Museum, Albert Museum, Birla Mandir Planetarium, Sisodia Rani Park, Lakshmi Narain Temple, Kanak Vrindavan, The Rajmahal Palace, Rambagh Palace (now a Luxury hotel), and other parks. 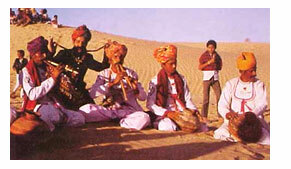 Other important tourist places around Jaipur are Ramgarh, Abhaneri, Balaji, and Karauli. Gangaur festival held in honor of goddess Parvati is celebrated after a few days after Holi in February/March on a grand scale. Primarily a women festival, married women pray for the long life of their husbands and unmarried girls pray for getting a good husband. Teej is a major festival in Jaipur celebrated during the months of July/August and dedicated to goddess Parvati. The festival celebrates the onset of the monsoon. Jaipur is famous for semi-precious stones and the best place to buy them is off is Jauhari Bazaar. Miniatures, handicrafts, clothes, jewelry of silver and lac are other items to be bought in Jaipur. The city is directly connected to Delhi, Mumbai, Jodhpur, Udaipur, and Ahmedabad through regular flights. All major domestic airlines have their services to Jaipur. Jaipur is also well connected by trains especially with New Delhi. If money is not a constraint for you, then the Palace-on-Wheels is the best option for you.